I can’t lie to you- the thought of being a bit mad/mysterious/dangerously brilliant, etc. always appealed to me. Growing up, I wanted to become the furthest thing from a dainty woman. I wanted to get my hands dirty, to be wondered about, to be as tough as balls, to keep as crazy and fearless as I could be. I hungered for more than just what was in front of me. That’s not to say I was a tomboy, or didn’t dress up, or anything of the sort. But I knew I felt an instant connection whenever I read Plath, and my friends can attest that I love being secretive and then living up the shock factor. So, it only feels fitting that I am now a Madwoman. Let me explain. 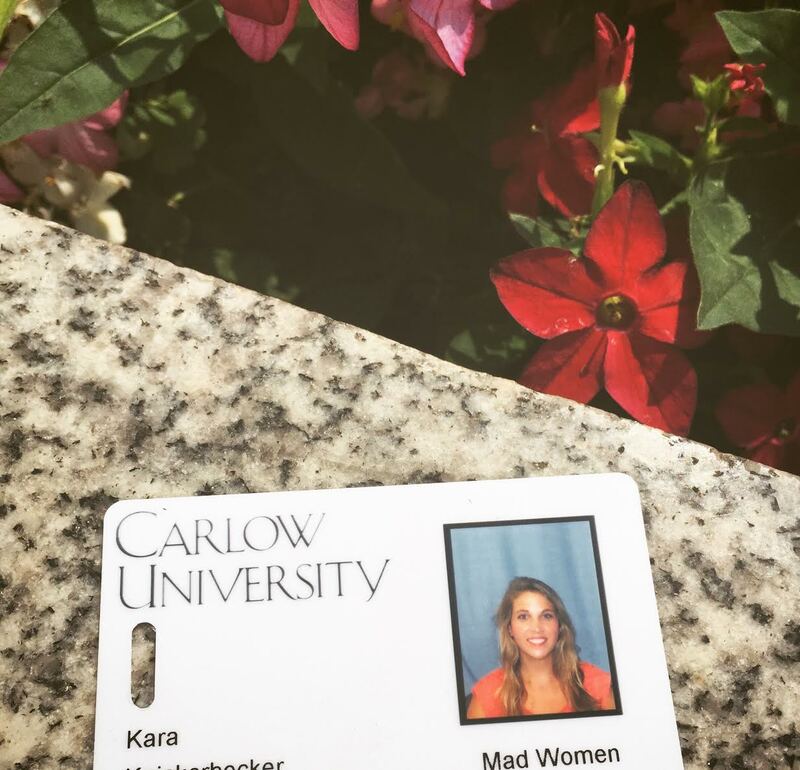 Last night, I had my first class in the workshop Madwomen in the Attic at Carlow University. I am taking a Creative Nonfiction workshop, once a week, for 12 weeks. I’ve always written poetry, but want to delve further into this genre I find so captivating. I want to learn how to write such truly personal, real, and raw stories that allow for an intimacy between the writer and the reader. When I left that room two hours later, I felt a mixture of two things- and neither were a surprise to me. First, I regretted not getting involved sooner. As many of you know, I have not written consistently for the past six years or so. Sitting there among a group of very diverse women (many who were much older than me) I suspect we all felt the same in that aspect. We introduced ourselves, talked about our experience with writing, our struggles with the process, etc. I felt so at home within these unfamiliar walls and with these strangers, because we shared the same passion and the same goal. No matter what paths we had traveled, or where we came from, we met at this intersection. To be united as women and have the support, the inspiration, the push to be better…The strength of that is unparalleled. Second, I felt young, inexperienced, nervous, inadequate. I haven’t written in forever, and have next to no experience writing creative nonfiction. Furthermore, guess who was chosen to go first to be workshopped? This girl. So, now I am off to create a story composed of 800 brilliant words, in which I do not even have the slightest clue where to start. For all you creative writers, what are some prompts you’ve used before to help get the words flowing, especially with this genre? Any other suggestions or tips on writing creative nonfiction? Would love to hear from you! P.S. A promise to you all: Whatever I write, I’ll reveal in a post two weeks from now! I actually haven’t tried creative non fictional, but you sold me at the “Sylvia plath” line 😁. Looking forward to your update on how it’s going. Inspiration doesn’t has a schedule. But I’m certain you will come up with something very soon. I’m not sure if my advice would be of any help, but I’d suggest that try to stick with what you love. You said you love Sylvia Plath, that means your inspiration comes from her. You may have read her works many times, but I think you should read them over and over again. Repetition may be boring , but keep doing the same thing over and over again can also show you something new. An architect who spends every minute on blueprints of buildings that look all the same can come up with something innovative because she has understand how to break away from things she has had been used to. May be you may find what you are searching for in Plath’s lines. I’ve only taken one creative writing class in which I had to write creative nonfiction, but what I ended up writing about was nothing more than a single incident in which I met a cute girl who worked at a Taco Bell (I can send it to you, if you want to read it). It was 2,000 words, so even if you pick only a small event in your life to write about, you should be able to cross 800 words very easily. The way I chose to write about this particular subject is that I wanted to write something that could be a subtle way of showing my humorous side. You know, by openly insulting Taco Bell while talking about how beautiful this girl who worked at that Taco Bell was. Irony, yo. So my advice to you is to pick some small thing in your life (and by that I mean a small scene, not necessarily an incident that had a small effect on you) and pour yourself on the page. Maybe you could write about something that happened in your life or a meeting you had with a particular friend or stranger that shows your hunger to get your hands dirty. By the way, creative nonfiction is very helpful to writing fiction. One thing I’ve done with my fiction writing is put myself into it; or other people, or real conversations. I change the names, of course, along with other small details to fictionalize it, but writing creative nonfiction is a great way to get material for fiction. So happy to hear from you! These were fantastic suggestions, as well. I am obviously interested in reading your work- you got me at Taco Bell haha. After just buckling down and making myself write, the story actually developed on its own. I would like to try next time to write more with humor, as usually I take the serious route, but humor is such a big part of my life and I have some awkward & funny stories to share. Fiction is one genre I have not dabbled in. I’m not sure I’d enjoy it or be as good writing it. Did you start off with fiction? I’ve mostly written fiction. What I like to do with fiction is take things that happen in my life and fictionalize them. For example, when I was writing my first novel, my rebellious protagonist, Kara, had a line in which she used the word “stated.” When a classmate read that during a workshop, he said that Kara didn’t strike him as the type of character who would use the word “stated.” I simply nodded and smiled and said I was okay with his comment, but later, I added an exchange of dialogue in a certain chapter in which Kara says the word “stated,” another character says that she doesn’t seem like the type of person to use the word “stated,” and Kara responds, “Hey, I can use whatever the f*** word I want. I can even use the word f*** wrong in a sentence and that’s okay.” So something someone really said to me became a nice example of Kara’s rebellious attitude. I did the same thing while beginning my second novel. Someone asked me what a “stereotypical alien” was and so of course I found a place where Kara could respond to that question in her own unique way. And that’s the great thing about fiction. Your characters are free to say and respond however they want. So if there’s something you want to get off your chest or there’s a certain way you wish you responded to something, you can write that and not only is it okay, but people could possibly connect to it because it’s what they would want to say or do if they were in that situation. I think if you give fiction a try, you could end up having a lot of fun with it, especially if you have a lot of stories to tell and ways they could’ve gone. But first things first. Focus on creative nonfiction and practice getting yourself on the page. That can really help with fiction writing. By the way, if you want to read my Taco Bell piece, please hit the Contact thingy on my page and send me an email. I’d post it, but I don’t want Taco Bell to hit me with a defamation lawsuit. Haha. Hi Kara, The first books I downloaded onto my kindle some years ago were 2 of Lee Gutkind’s books on Creative Nonfiction. I was trying to finish my memoir based on childhood memories at the time, and was gettng stuck. He was the first to teach me that you can write about the truth using all the devices of fiction, that is vivid imagery, strong characterisation, lively dialogue and dramatic scenes. In other words “showing”, rather than “telling”. (Your one constraint is the necessity to stick to the facts.) This not to say that you can’t “tell” when you want to. It’s all about balance. I put that memoir aside and got on with a novel, as I hadn’t yet found a suitable focus for my memoir. That is also important, because you can’t include everything in your life; you have to find the right focus, from the beginning, to guide you on the trajectory. The other important thing is the narrative arc. (See my posts about this under “Craft of Fiction”, write4publish.com) You need to be able to say in one or two sentences, what the memoir is about: not always easy. I just discovered your blog, and post about narrative arc, and am excited to read further! You give such useful tips.I will have to check out Lee Gutkind as well. For shorter pieces of creative nonfiction (or even longer ones), do you have any suggestions on how to uncover a purpose or a “so what?” to the reader? For instance, how do you make them care about what you’re writing about, and relate it to them? Many things that we could write about (meeting a new friend, an embarrassing moment, etc.) seem quite average in the scheme of things.